Bernhard ten Brinke look back with a good feeling on the first stage in the Dakar Rally. The racing driver from Zeddam closed the trip of 331 km with a special stage of 84 km in Peru as the eighth. Ten Brinke, who this year for the fifth time participate in the Dakar Rally and hopes to do to the final victory, came at three minutes and nineteen seconds of winner Toyota team-mate Nasser Al Attiyah to the finish. For Gerard de Rooy was the first stage slightly less prosperous. The trucker was 20 kilometres from the finish but lost by an overheated tire and a faltering turbosensor the necessary time. 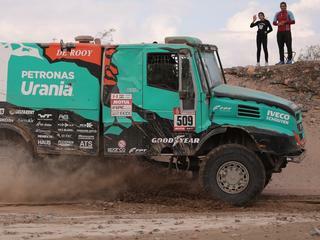 Ton van Genugten, team-mate of De Rooy at Iveco, came as second over the finish line. He had only the Russian Eduard Nikolaev of Kamaz, eighteen seconds faster was for him to tolerate. The second stage of the Dakar Rally will be held Tuesday from Pisco to San Juan de Marcona. After a connection route of 211 kilometers, wait for a ‘special stage’ of 342 kilometres.